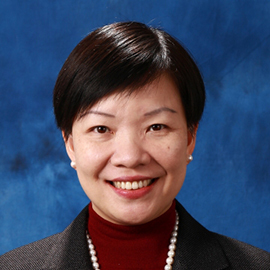 Helen Meng is Professor and Chairman of the Department of Systems Engineering and Engineering Management at The Chinese University of Hong Kong (CUHK). She is the Founding Director of the CUHK MoE-Microsoft Key Laboratory for Human-Centric Computing and Interface Technologies, Tsinghua-CUHK Joint Research Center for Media Sciences, Technologies and Systems, and the Stanley Ho Big Data Decision Analytics Research Center. Previously she has served as Associate Dean (Research) of Engineering, Editor-in-Chief of the IEEE Transactions on Audio, Speech and Language Processing, and in the IEEE Board of Governors. Her other professional services include membership in the HKSAR Government’s (HKSARG) Steering Committee on eHealth Record Sharing, Research Grants Council, Convenor of the Engineering Panel Competitive Research Funding Schemes for the Self-financing Degree Sector, Hong Kong/Guangdong ICT Expert Committee and Coordinator of the Working Group on Big Data Research and Applications, and Chairlady of the Working Party of the Manpower Survey of the Information Technology Sector for both 2014-2015 and 2016-2017. She has also served in the HKSARG’s Digital 21 Strategy Advisory Committee, and the review panels of HKSARG’s Innovation and Technology Commission and the Swiss National Science Foundation’s National Centers of Competence in Research. Helen received all her degrees from MIT. She was elected APSIPA Distinguished Lecturer 2012-2013 and ISCA Distinguished Lecturer 2015-2016. She received the Ministry of Education Higher Education Outstanding Scientific Research Output Award 2009, Hong Kong Computer Society’s inaugural Outstanding ICT (Information and Communication Technologies) Woman Professional Award 2015, Microsoft Research Outstanding Collaborator Award in 2016, ICME 2016 Best Paper Award and the IBM Faculty Award 2016. Helen is a Fellow of HKCS, HKIE, ISCA and IEEE.